Why there? Why now? Why a tank? 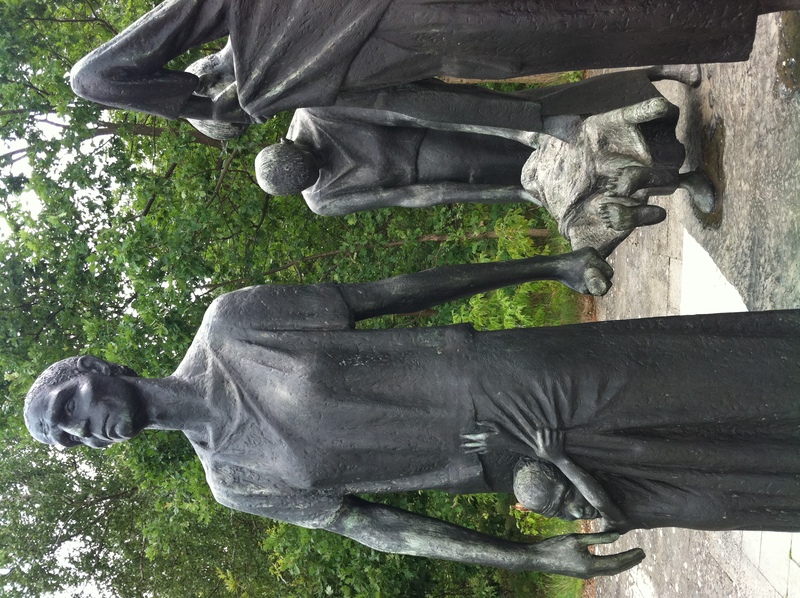 At 30th of April 1945, Russian troops freed CC Ravensbrueck, the largest women’s concentration camp of the Nazis, with 70 subcamps also in remote areas, a men’s camp and a youth camp for females. About 130.000 women had been registered as prisoners in the Ravensbrueck CC system, plus 20.000 men and 1000 girls, they came from 40 nations. About 30.000-40.000 died in Ravensbrueck, many more in other places, only between 15,000 and 32,000 of all survived. Some campanies such as Siemens had major production facilies built there and exploited Ravensbrueck prisoners for forced labour. The former camp is located app 100 km north of Berlin. On the way to its entrance, at Ravensbruecker Dorfstrasse, an old Russian tank stands as memorial for the liberation of the camp. This year, the annual remembrance weekend for the Liberation of the Ravensbrueck Concentration Camp is at 19th-22nd April, 2012. 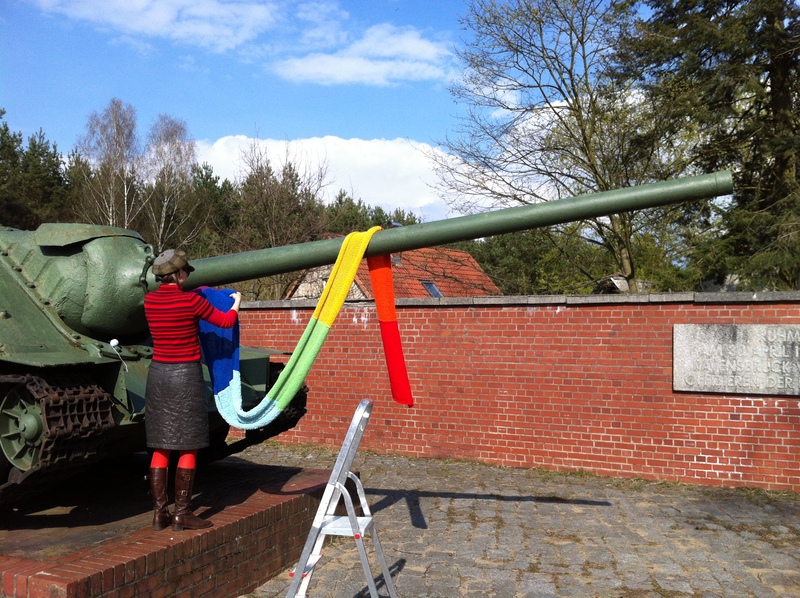 This Knitting4Peace project was attached to the tank in the night of 21st to 22nd April, because at 22nd April most of the rembrance events take place there. Yes, I have been born long after the war. But yes – I still care about history. Especially about the complicated history of the country I was born in (which was actually East Germany). Especially about the history of my own family. My family encompasses much of German (or European) history. Both parents are refugees, displaced persons from former German settlements. My father was born in East Prussia, in Königsberg, now Russian and named Kaliningrad. He saw the city burn down to the grounds from a village nearby. My mother was born in Bessarabia, a region around Kishinjew, which had been Russian, Rumanian or Moldavian in the past – and is now a part of Moldavia again. Both had to leave their home region in war times and both have never seen them again. The brother of my mum had to join the armed forces to “save his country and help the Fuehrer” when he was 17 years old. He became member of the Waffen SS, worked as a translator for Russian language and served as watchpost at Concentration Camp Sachsenhausen, which is also North of Berlin, not very far from Ravensbrueck. I don’t know much of his time there. Shortly after, he came back to the battlefield and died, 19 years old, most likely somewhere in Hungary. The exact place is not known. After WW2, his father – my grand father – a lawyer and judge, was imprisoned by the Russians and captured for many years in that same Concentration Camp in Sachsenhausen – then NKVD Special Camp Number 7. He survived but not for many years and died in his early 60s. My step-Grandfather (from my fathers side), however, was captured as prisoner of war by the Britains after he was part of the German troops in the Normandie, when the Allies landed there on D-Day. He was imprisoned in England and than for several years in prisoner of war camps in Egypt. He survived and is still alive today. So that is my family. Should I not get involved in history? Should I not help remember? My parents raised me with a strong sense of responsibility, a love for peace and tolerance but with a despise for war and discrimination. A rainbow cover? Flowers? What does it mean? I love colours. I love peace. I love tolerance and freedom. The rainbow colours are a perfect symbol for all of these. The peaceflag: rainbow colours. The flag for homosexuals: rainbow colours. The rainbow stands for nature and for the beauty of diversity. The rainbow encompasses all that is – from beginning to end. Its a bridge of live and beauty. The liberation of the CC Ravensbrueck was bringing peace after years of war and torture to all survivors. Although the majority of prisoners had been Polish women and/or Jewish women, many have been there because of their religious belief, political activities or for their sexual orientation. This very year, a new memorial plate will remind of the homosexual victims of CC Ravensbrueck. In all times and in all regions of the world, flowers attached to weapons have been used to celebrate the end of armed conflicts. The crocheted flowers I attached to the knitted tank canon cover have exactly this meaning. 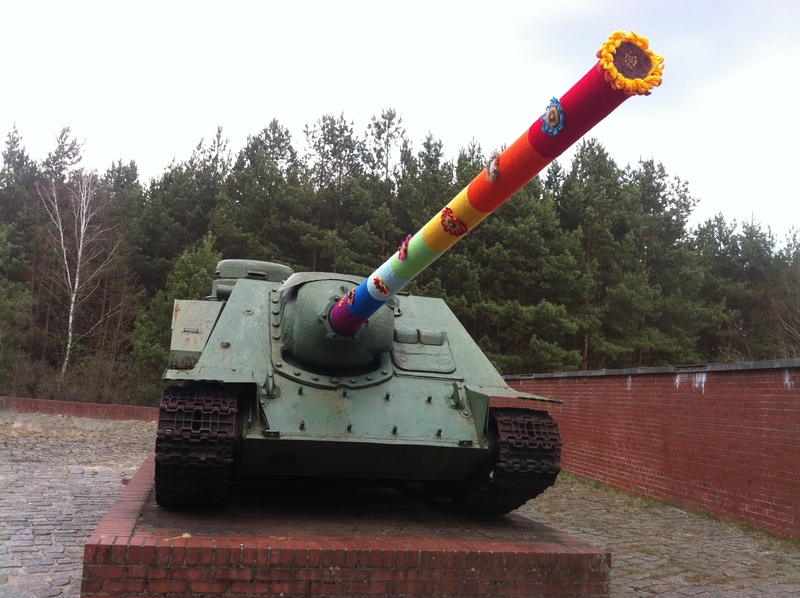 I am beautifying the tank with flowers to show – war is over, we enjoy living in peace and, last but not least: thank you Russians, for having liberated this place. Outdoor knitting is a getting more popular. You find guerillaknitting/ yarnbombing / yarnstorming / knit grafitty – all expressions for this type of streetart, everywhere in the world. From Texas (where it all started) to Helsinki, from Saltburn in Britain to Davonport in New Zealand or Wiesbaden in Germany. I am an artist, using textile material to express myself. My outdoor art sometimes has a specific message – like the Knitting4Peace project. Sometimes, it just means beautifying urban landscapes in areas which quite need beautifying or which are already beautiful and look even better with a little knit around. Sometimes, I only want to create something which makes people smile. 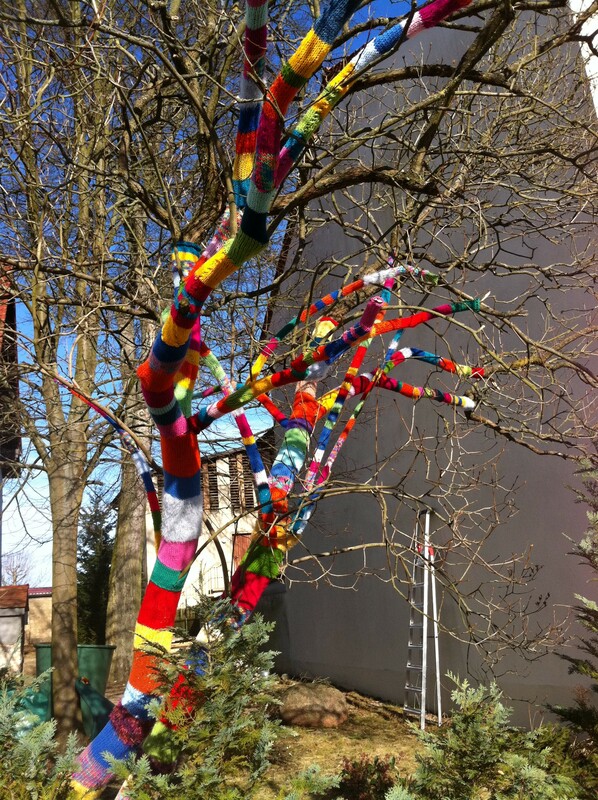 Passersby love discovering a tree wrapped with knitting in bright colours, or yarnstormed sign posts, bycicle racks or street lamps. 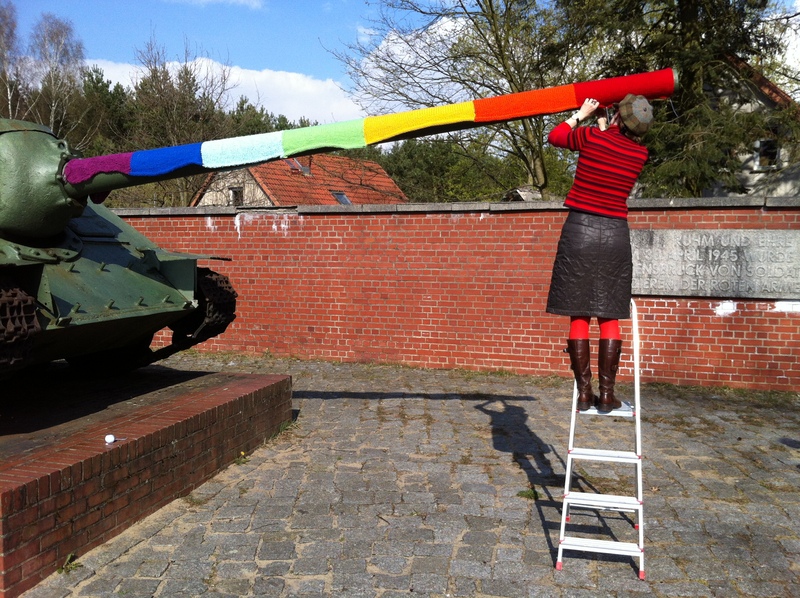 Guerrilla-knitting means taking back public space with a non-invasive type of art. 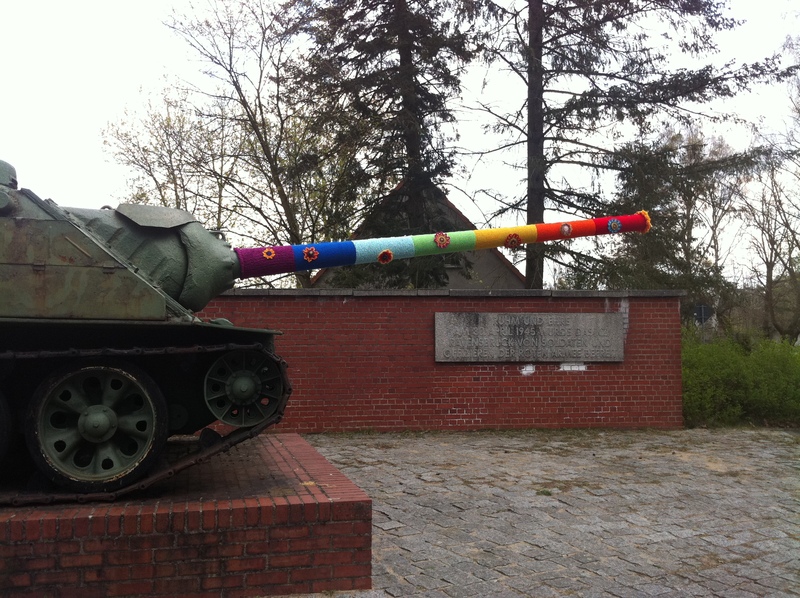 Knit graffiti doesn’t destroy anything. It is a show off of a core female craft. See HERE for a picture gallery on the Knitting4Peace making of. 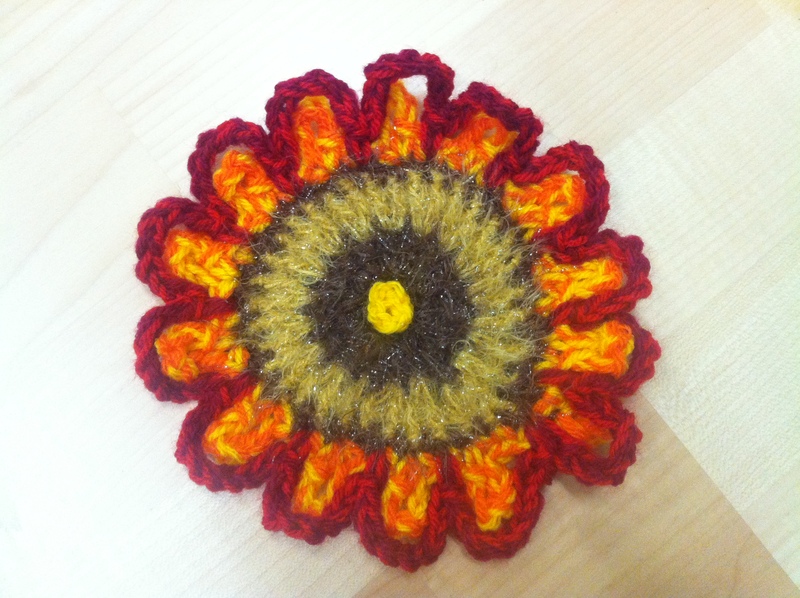 See HERE for a picture gallery on the final Knitting4Peace project (coming soon). See here or here or here for cool pic collections of yarnstorming. This entry was posted in knitting with a mission, Nitthaeck projects and tagged Germany, history, knitting4peace, Nitthaeck, peace, Ravensbrueck, war. Bookmark the permalink. thank you for your work of art and contributing to this inspiring art form the induces a nurturing heart. I am feeling more brave to be more artistically communicative and my family will be greatly inspired.